Featured in the latest episode of MOYERS & COMPANY!! Won Best Documentary Short, Audience Award at The Asheville Cinema Festival! Chosen by Bill Moyers for his list of "Ten Documentaries on Champions of Social Justice"! Check out the list. "An exceptional film. Superb in situating the Court case in a historical context." "A story that is beautifully rendered. 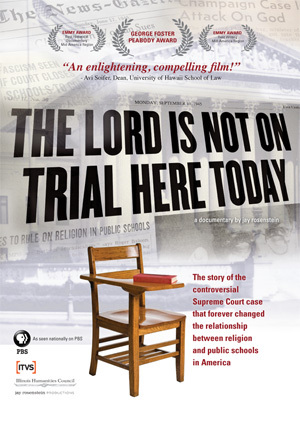 While the eventual Supreme Court victory plays out in a taut dramatic presentation, the documentary is just as significant for its resonance in the contemporary moment." "A remarkable story of how one citizen's courage and idealism profoundly affected a nation's future, this is highly recommended." "A superb new documentary. This is one... that you won't want to miss, and that you'll want your kids to see!" "Why religion isn't taught in our public schools." " The Lord is not on Trial Here Today' (tells) a little-known story of a woman, a court case, and a movement that changed American society forever and for the better." Check out Dan McCollum's book "The Lord Was Not On Trial"